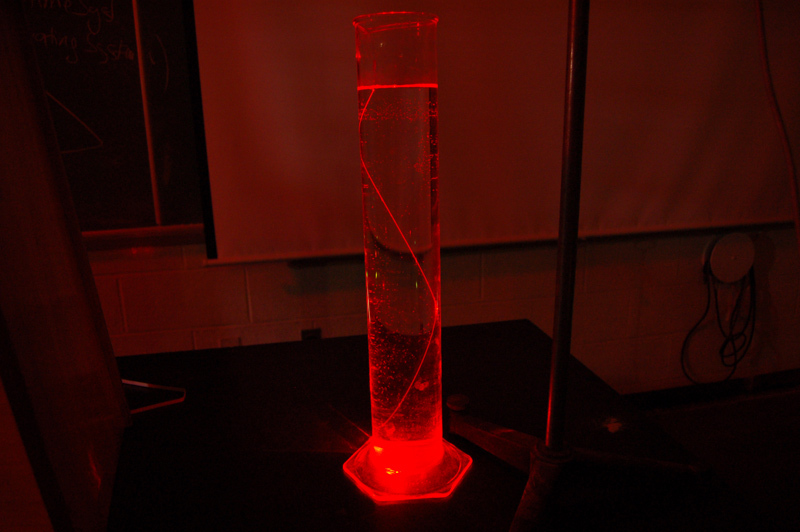 Description: With a small tank of water, you can use a laser beam to show the critical angle. Add a little bit of powdered milk. Mix it in. Mount the laser on the stand. The high intensity laser must be used for this to be most effective. Aim the laser into the tank so that total internal reflection occurs. Plug in the laser. Note that the laser beam experiences total internal reflection, and travels down the container walls. When finished, turn off the laser. Do not stare at the laser beam. Do not point the laser at students. Note: This picture is time elapsed. In person, the beam will not be as bright.